This recipe from my husband, The Chef Instead, is one of his favourites for Sunday breakfast. When we worked as caterers in the movie business together, he used to make this for the cast and crew to add to pancakes or waffles or even hot oatmeal. 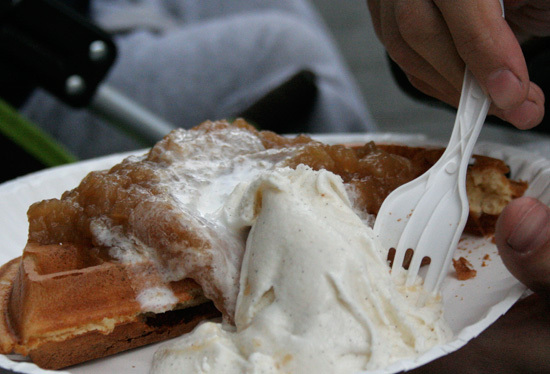 It’s good with yogurt, or even ice cream as a dessert! 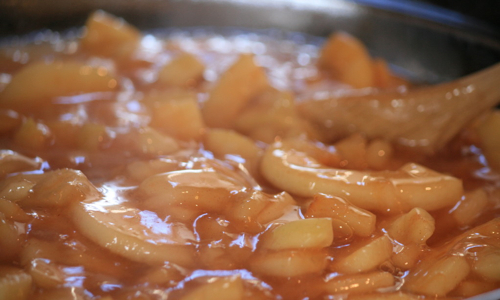 In a large saucepan, combine the water, apples, sugar, spice and bring to a boil. Lower the heat and simmer, stirring occasionally, until the apples are tender but not mushy and the mixture is a bit thicker. around 10 to 15 minutes. If needed, add your cornstarch diluted in a touch of water. Remove from the heat and let cool to room temperature before serving and remember this mixture will also thicken a bit as it cools off. Serve warm with breakfast dishes like pancakes, French toast, or even waffles and ice cream as a dessert after a day outside.